Stories in the AFL this week include , the ongoing scandal surrounding the Dons , and drugs . Those ageing and injury riddled players , who are contemplating retirement , and your teams final chances . In summary , the Saints are on a downhill slide , Freo finishing well , Dees getting thrashed , Suns on the rise , GWS still trying , Tigers beat ninth spot hoodoo , Swans keep winning , Carlton patchy , Collingwood rolling with the punches , Hawthorn top spot holders , Cats are winners , Doggies playing erratically , Port and Blues hopeful , Eagles ,Lions , Crows , and Kangas all locked on seven wins . 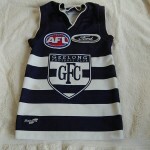 This entry was posted on Thursday, August 1st, 2013 at 11:26 am	and is filed under AFL, football jumpers. You can follow any responses to this entry through the RSS 2.0 feed. Both comments and pings are currently closed.